The demonization of young migrants and their families may be shocking, but these policies and practices are neither new nor surprising. On October 24, 2017, United States Customs and Border Protection apprehended an unauthorized 10-year-old girl with cerebral palsy while an ambulance transported her to a Texas hospital for emergency surgery. After a well-publicized outcry from members of Congress, physicians, lawyers and celebrities, she was released on November 23. These two cases are shocking for many people; they elicit and implicate deeply-held views around women’s health, the treatment of people with disabilities, and governmental overreach. That they simultaneously involve youth, and unauthorized migrant youth more specifically, confronts the public with an unfolding and likely unsettling reality—namely, the ongoing contradictions of immigrant “management” in the US. There is ample, and indeed growing, popular press on the contradictions of immigration detention, much of it depicting young migrants as delinquent and their parents as liable. As scholars of global youth, we are familiar with this material both as clickbait and as evidence of the racialized trends our work more deeply documents. What is less intelligible to us, and increasingly surprising, is that anthropological knowledge—expertise developed through sustained ethnographic engagement—remains peripheral to these accounts. Often, it is silent. From the immediate treatment of children and families, these contradictions extend to the administration’s callous repeal of Temporary Protected Status for nearly 200,000 Salvadorans, many of whom have lived in the US for over a decade. Meanwhile, Congress’s gutless behavior on matters of border security trades away Deferred Action for Childhood Arrivals (DACA) for increased border security and enforcement. These negotiations are more destructive than many realize, including the possibility of Democrats settling for pernicious interior enforcement measures and the ongoing neutralizing of sanctuary cities through incentives to local and state law enforcement. Meanwhile, families continue to be torn apart. These expedited portrayals and partial reports only bolster narratives of surprise, novelty, and immediacy, as if such structures and effects are new rather than familiar and long-standing. Anthropologists’ absence from media and political discourse on immigrant detention has critical consequences for the public, for policymakers, and most importantly, for the individuals at the center of our research—youth who are often reduced to the all-too-familiar, xenophobic stereotypes of vulnerable victims, delinquents or gang members, or carriers of disease. Take, for example, ethnographic research with unaccompanied migrant youth in the US. As our own work documents, organizations and advocates largely rely upon racialized and often infantilizing tropes as they care for and advocate on behalf of young people (Heidbrink 2014; Statz 2018). At the same time, unaccompanied children explicitly challenge conceptualizations of child passivity through their unauthorized and independent presence, and implicitly via their movement through multiple geographic and institutional sites in search of care, education, or employment. 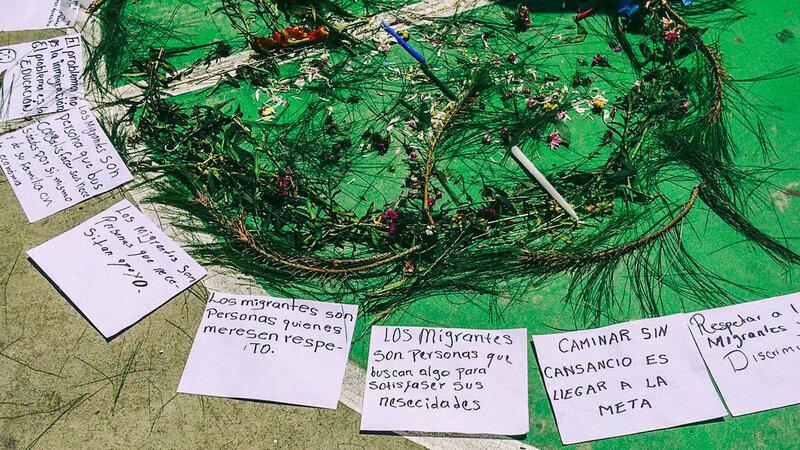 The victimization narrative persists—ignoring young migrants as social actors, decontextualizing the conditions spurring their migration, and criminalizing parents—yet our ethnographic data actively thwart it. Research with Chinese and Guatemalan youth powerfully unsettles popular and policy assessments of caregivers as “unenlightened parents” and communities as “backward cultures.” It refutes legal claims in which migratory debt is framed as “parental abuse.” Here, belonging emerges as practiced and sustained over time and across distances; debt is understood in terms of relationality, binding youth to family and wider communities. By concurrently and critically focusing on the social agency of young migrants, we challenge these portrayals, revealing a contextualized understanding of how and why young people are on the move. This in turn helps illuminate the unanticipated consequences of policies and advocacy efforts on youth and their families, even as they are deemed “successful.” Anthropologists are uniquely poised to challenge and expand the narrow parameters by which young migrants, their parents, and their cultural contexts are covered in the media (Heidbrink and Statz 2017). Our research is not unique, we work within broad, international networks of scholars doing critical and timely research on migration, youth, policy and bureaucracy. As anthropologists, we are not surprised by the injustices and contradictions. That we are not surprised—but the public is—indicates a massive professional failure on our part. At the AAA Annual Meeting in November, incoming AAA President Alex Barker argued that “it is not enough for anthropologists to be social critics…the anthropologist’s responsibility to illuminate requires thinking in dark times.” Yet as evidenced by the many media articles and broadcasts that notably do not reference academic publications, we have failed to illuminate—even when our public audience is most unsettled and in need of information. To elucidate the remarkably unsurprising nature of immigration policy and management in the US, we must reach broader and more diverse publics. Many of us are doing this in collaboration with our students and in support of undocumented students, and we recognize that these efforts, all of which are motivated by time-intensive, community-engaged fieldwork, are often derailed by expectations of free academic labor for peer review or by delayed publication in professional journals. With full appreciation for the important work of moving key theoretical debates forward in our specialized fields, we must also translate our teaching and research into accessible and timely formats. In other words, what we know and what we do must be presented as compelling, rigorous, and competitive across diverse digital platforms. While democratizing access to academic knowledge via open access journals is an important step, researchers of im/migration must be even more expansive in how we communicate. Through multimedia formats—blogs, podcasts, photo journals, digital stories—we can reach broader and more diverse publics. Our collaborative work with Youth Circulations, a site dedicated to bringing youth-centered research to global public and academic audiences, reveals this. With over 8,000 unique visitors and growing, it is a powerful reminder of the demand for nuanced, informed, and accessible analysis. In an era when the relevance of higher education generally and social sciences specifically are under assault, and when im/migrants are perpetually spotlighted—or surveilled—in media, policy, and law enforcement, anthropologists of migration are urgently tasked with demonstrating the relevance and power of our applied knowledge. In other words, what we already know about immigration injustice in the US matters. Through community events, public art exhibits, public lectures, podcasts, and op-eds, anthropology must bring our research to a broader public. We must likewise train students on the importance of and skills to ethically conduct engaged scholarship. In the meantime, as Christopher Mooney recently argued, institutions of higher education must also accord value to public, engaged scholarship by recognizing it in tenure processes and incentivizing it through institutional grants and service credit. Applying our knowledge to public policy brings with it complications, contradictions, and ethical dilemmas. For example, migration scholars are routinely asked to draft affidavits as country conditions experts in support of asylum petitions. So doing, we wrestle with how to effectively support individual claims to limited forms of legal relief while not essentializing cultures and countries, which immigration law is wont to do. This is profoundly challenging, but also a powerful opportunity. Just as we do in fieldwork, engaging with these dilemmas in practice often yields productive insights and clarity in our innovation. It likewise introduces, and occasionally demands, the value of collaboratively processing and evaluating our public efforts with colleagues facing similar choices. There are, of course, more deliberate and sustained opportunities for engaged public work. It is not enough to critique the intended and unintended consequences of public policy; our response must be to harness our experiences and the expertise of the communities with which we work to address or even bypass these consequences. This includes participating in broad national networks and trainingin engaged public policy and even bringing our work and anthropological understandings into direct public service. While the increased public attention to the intricacies of young people’s experiences of migration and detention is important, the shock value accorded to the discrimination of society’s “most vulnerable”—abused, pregnant, disabled, children—is overdue and sadly misplaced. Public anthropology is increasingly tasked with demonstrating the mundaneness of realities such as this. The glaring conspicuousness by which state actors demonize young migrants and their families may be shocking, but these policies and practices are notably not new and not surprising. Rather than supply data as BuzzFeed fodder, anthropologists must make efforts to dismantle the surprise and novelty of these realities by offering the socio-political context and lived histories that evidence the discrimination that im/migrants in the US have experienced all along.